The Gourmet Diabetic: Oh Snap! Place the dried tomatoes in almost boiling water and allow them to soak until the water is cool enough to handle. Set the oven to heat to 220°C (or 425°F). 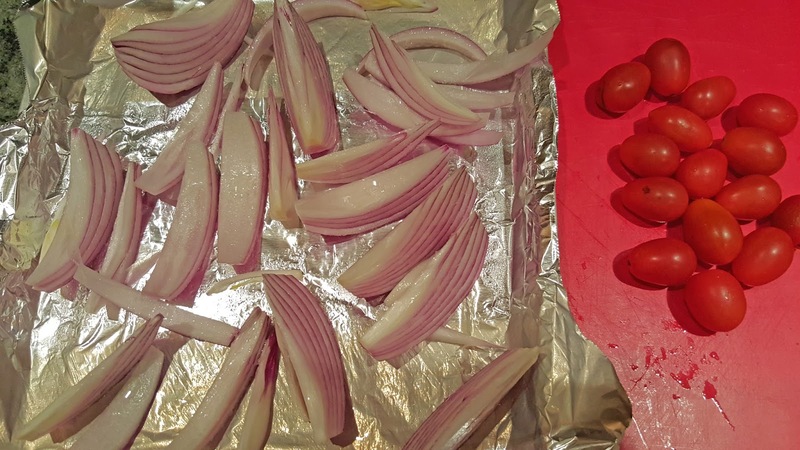 Remove the tomato slices from the water, squeeze them gently, and chop them roughly. Place the tomato slices with the almonds, olives, parsley, and garlic into a blender or food processor and grind them, gradually adding the salad grade olive oil, until a thick but spreadable paste is formed. Rinse the snapper and open it up as much as possible along the line of the belly, pressing it out as flat as possible on its back. Spread the almond-olive paste inside the snapper, and fold it back into its original shape as much as possible. Spray or drizzle enough cooking grade olive oil on the skin of the snapper to cover it with a thin film. Salt and pepper the skin to taste. 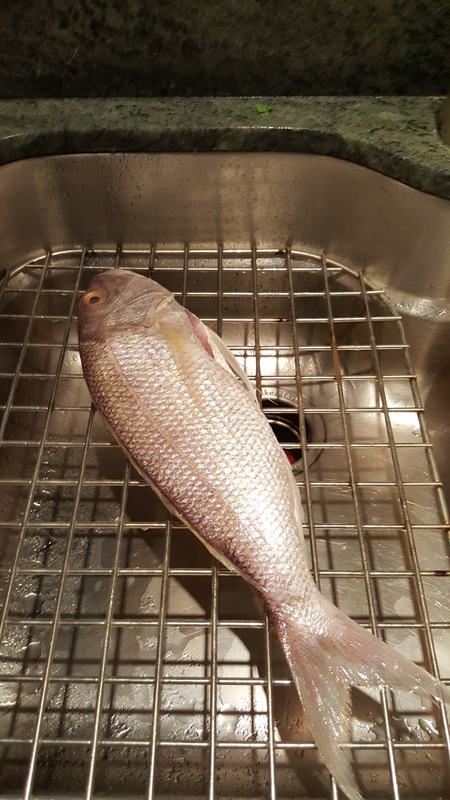 Place the snapper on a baking tray lined with foil and bake it in the oven for 20 minutes. Meanwhile, peel the onion and remove the root but keep the core intact. 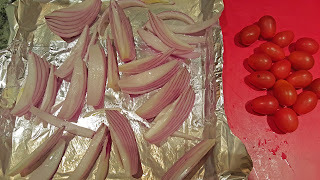 Spray or smear a baking pan with cooking grade olive oil and place the onion wedges in the pan. Lightly spray or brush them with the olive oil. 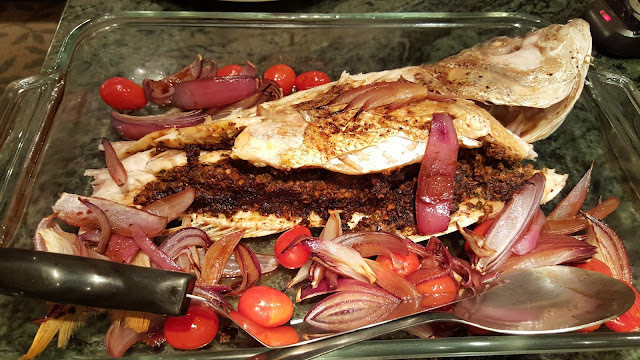 Sprinkle or drip the balsamic vinegar onto the onion wedges. 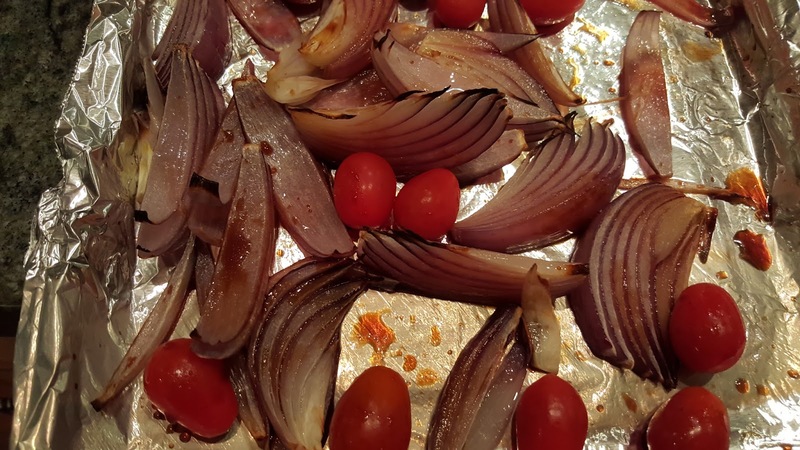 Add the cherry tomatoes into the baking pan and stir them to coat with some of the olive oil and vinegar. Allow the onion and tomatoes to rest in the cooling oven for 5 minutes, or until ready to be added to the snapper on a serving dish. 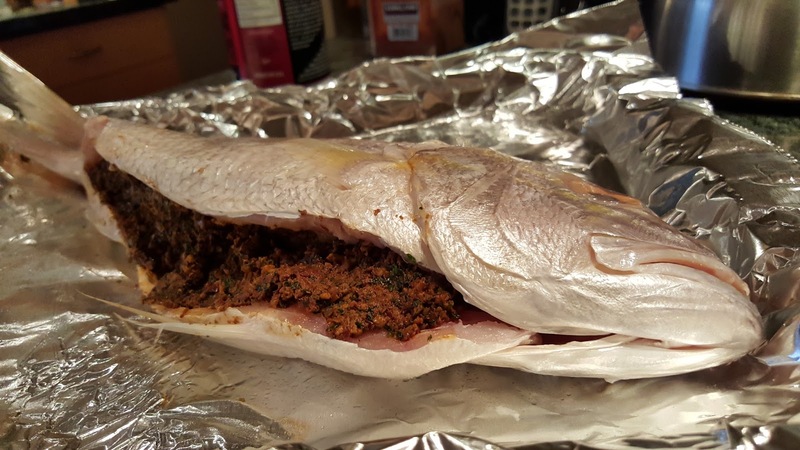 I found this recipe on the hoof, using my cell phone to search "Greek stuffed snapper", when we discovered a nice snapper in the seafood section of our local market. 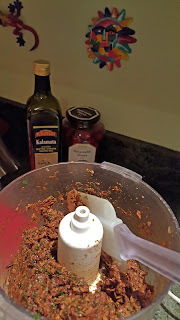 It was not the combination of ingredients that I had been imagining as "Greek", but looked interesting and I had half of the ingredients in the refrigerator at home. Good choice, we enjoyed it served with a spinach-mushroom stir fry with garlic and a hint of goat cheese, over brown rice.